The common yew or taxus baccata is the only hedging conifer native to Europe and the UK and is therefore often referred to as the English yew or the European yew. It is also one of the most popular hedging plants in our part of the world, as it has a number of qualities that make it the ideal species for formal hedging purposes. Its growth habit is dense and compact and its slow growth rate – no more than 20 centimetres per year – causes a common yew hedge to retain its shape for a long time. In fact, due to this growth rate, taxus baccata can even be used for topiary. The common yew is a true evergreen hedging classic that will thrive in just about any European garden. While taxus baccata is renowned for the fact that it does not grow very fast, it is worth nothing that a common yew grows up to 35 centimetres per year during the first three years after planting. 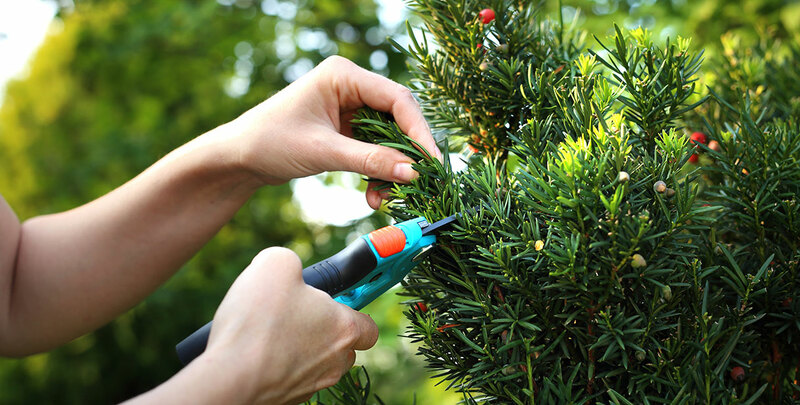 Therefore, a young common yew hedge may require bi-annual pruning. It should also be watered frequently immediately after planting. When the plants mature, their growth rate slows down significantly, they do not require as much water and the pruning frequency can be limited to once a year. It does tolerate hard pruning, however, and can even be cut back to old wood. The common yew can reach an age of well over 400 years if maintained properly. Keeping in mind that the English yew is in fact a hedging conifer, it is important to note that it does not like standing in a soil that is too wet. Even during their younger years, when they need more water than after becoming established, it is important to plant a common yew hedge in a soil that allows the water to drain. If your garden contains a heavy clay soil, it is still possible to plant a yew hedge, provided that you take serious measures to drain the soil. If you take these precautions prior to planting your English yew hedge, maintaining it will simply be a breeze. In the unlikely event that your taxus baccata hedge becomes overgrown, you can easily rejuvenate it by cutting it back to its bare wood. 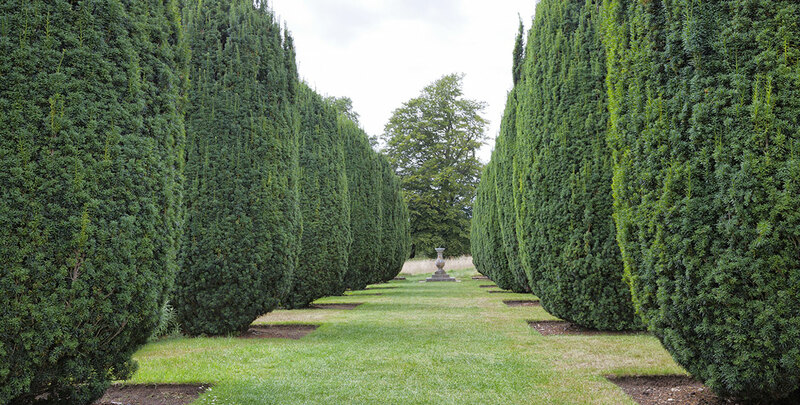 The common yew is often used to grow a highly formal conifer hedge and therefore trimmed twice a year in order to clearly define its rectangular shape. As it does not grow very fast, one annual pruning session is enough to keep your English yew hedge from growing out of control. In the autumn, the common yew will produce berries with a striking red colour, but these are often removed in order to maintain a formal appearance. One thing to keep in mind, however, is that almost all the parts of taxus baccata are highly poisonous to all mammals. But you can allow the berries to stay on for the birds, if you don’t mind a slightly less formal hedge.